This volume brings together a set of fundamental contributions, many translated into English for this publication, along with an important introduction. 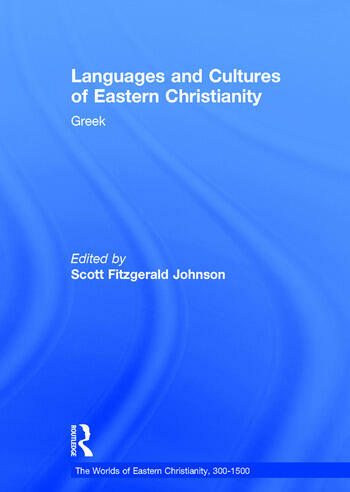 Together these explore the role of Greek among Christian communities in the late antique and Byzantine East (late Roman Oriens), specifically in the areas outside of the immediate sway of Constantinople and imperial Asia Minor. The local identities based around indigenous eastern Christian languages (Syriac, Coptic, Armenian, Georgian, etc.) and post-Chalcedonian doctrinal confessions (Miaphysite, Church of the East, Melkite, Maronite) were solidifying precisely as the Byzantine polity in the East was extinguished by the Arab conquests of the seventh century. In this multilayered cultural environment, Greek was a common social touchstone for all of these Christian communities, not only because of the shared Greek heritage of the early Church, but also because of the continued value of Greek theological, hagiographical, and liturgical writings. However, these interactions were dynamic and living, so that the Greek of the medieval Near East was itself transformed by such engagement with eastern Christian literature, appropriating new ideas and new texts into the Byzantine repertoire in the process. Contents: Preface; Introduction: the social presence of Greek in Eastern Christianity, 200-1200 CE; Sextus Julius Africanus and the Roman Near East in the third century, William Adler; Ethnic identity in the Roman Near East, AD 325-450: language, religion, and culture, Fergus Millar; Bilingualism and diglossia in late antique Syria and Mesopotamia, David Taylor; The private life of a man of letters: well-read practices in Byzantine Egypt according to the Dossier of Dioscorus of Aphrodito, Jean-Luc Fournet; Dioscorus and the question of bilingualism in sixth-century Egypt, Arietta Papaconstantinou; Palestinian hagiography and the reception of the Council of Chalcedon, Bernard Flusin; The Christian schools of Palestine: a chapter in literary history, Glanville Downey; Embellishing the steps: elements of presentation and style in The Heavenly Ladder of John Climacus, John Duffy; The works of Anastasius of Sinai: a key source for the history of seventh-century East Mediterranean society and belief, John Haldon; Greek literature in Palestine in the eighth century, Robert Pierpont Blake; Greek culture in Palestine after the Arab conquest, Cyril Mango; Some reflections on the continuity of Greek culture in the East in the seventh and eighth centuries, Guglielmo Cavallo; From Palestine to Constantinople (eighth-ninth centuries): Stephen the Sabaite and John of Damascus, Marie-France Auzépy; The Life of Theodore of Edessa: history, hagiography, and religious apologetics in Mar Saba monastery in early Abbasid times, Sidney Griffith; Why did Arabic succeed where Greek failed? Language change in the Near East after Muhammad, David Wasserstein; From Arabic to Greek, then to Georgian: a life of Saint John of Damascus, Bernard Flusin; Greek - Syriac - Arabic: the relationship between liturgical and colloquial languages in Melkite Palestine in the twelfth and thirteenth centuries, Johannes Pahlitzsch; The liturgy of the Melkite Patriarchs from 969 to 1300, Joseph Nasrallah; Byzantium's place in the debate over Orientalism, Averil Cameron; Index. Scott Fitzgerald Johnson is Dumbarton Oaks Teaching Fellow in Byzantine Greek at Georgetown University, USA.